In my last article I pointed to a Chicago Tribune column by Dawn Turner, titled "Interactive maps could combat Chicago violence". In the paragraphs below I provide an example of leadership that could be taken by anyone in one of Chicago's high violence community areas (or beyond). 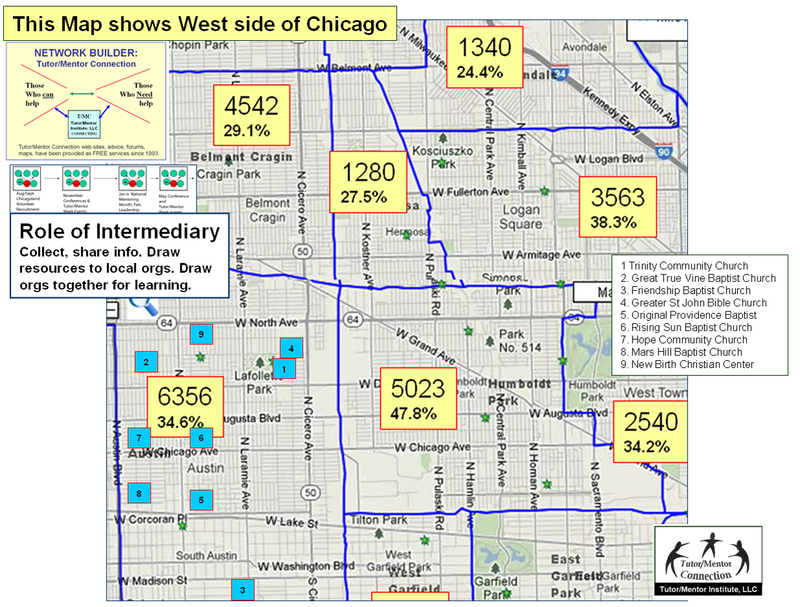 Here's a map showing community areas on the West side of Chicago, with information showing the number of low income youth age 6-17 in each community area. 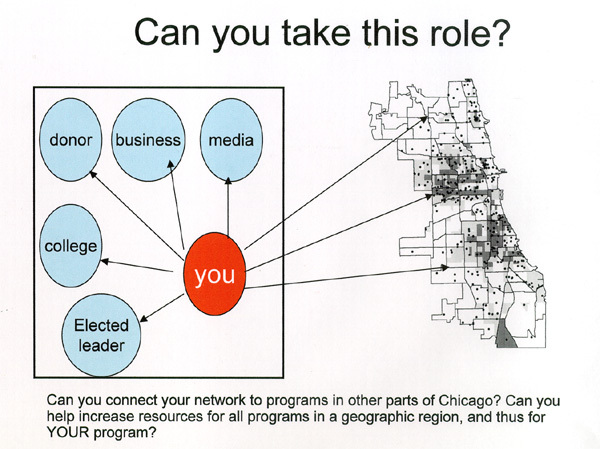 This is from a report I produce a couple of years ago, using the Tutor/Mentor Program Locator's interactive maps (which are not working now). The green stars on the map are organizations in my database, who provide some form of tutoring and/or mentoring. I've added information showing churches in the Austin area, who I've learned also support mentoring strategies. 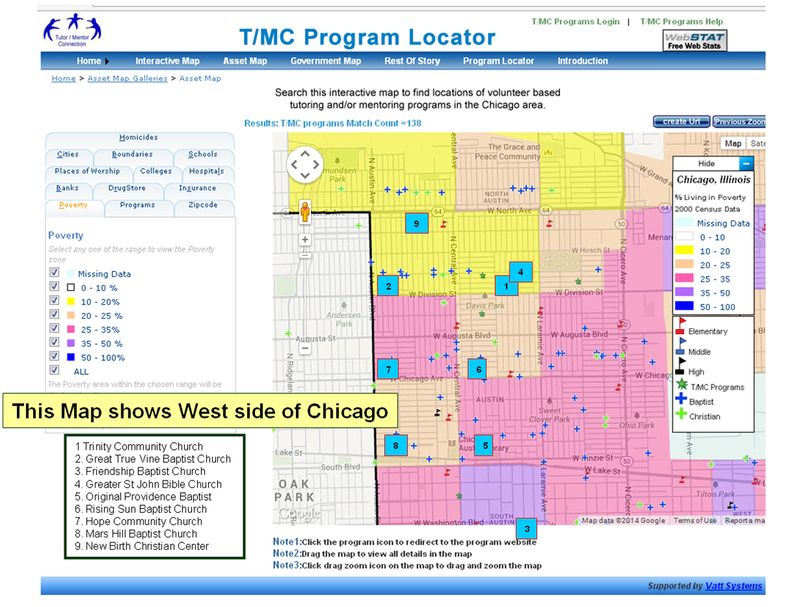 Below is another view of the West side of Chicago, also created using the Program Locator. On this view I added layers showing poverty and showing poorly performing schools. I also added locations of Baptist and Christian Churches. If you look at the tabs on this graphic, you'll see that I could have also added information on other assets, such as banks, hospitals, universities, drug stores and insurance companies. This map view could have zoomed in to just the Austin area. Using another section of the Program Locator, it could also have shown political districts (Congressional, State Legislator, State Senate). See gallery of maps created between 2008 and 2010. The idea is to show everyone who shares the same geography, who should be working to help high quality learning, mentoring, tutoring, jobs programs and health programs be available to youth in the area. This map shows the location of BUILD, Inc, which has a new facility on Chicago's West side. 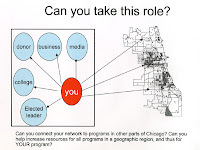 On this map I include a graphic showing the role of intermediaries, who collect and share information that anyone can use to support the growth of mentor-rich organizations. 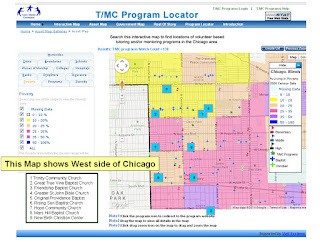 I also include a graphic showing quarterly events that could be held in the neighborhood, and in the city, to draw attention to map stories and draw volunteers and donors to each of the programs operating in different community areas...based on what they show on their web site and what volunteers and donors are learning to look for as they shop for a place to get involved. I've been collecting this information for over 20 years and have been sharing strategies for as long. Thus, I don't expect most people to have an intuitive understanding of the strategies I'm proposing. What I do propose is that leaders recruit teams of youth and volunteers who dig into the information the way interns have been doing since 2006. Click on this page and find visualizations, videos and blog articles which share understanding of Tutor/Mentor Connection strategies. 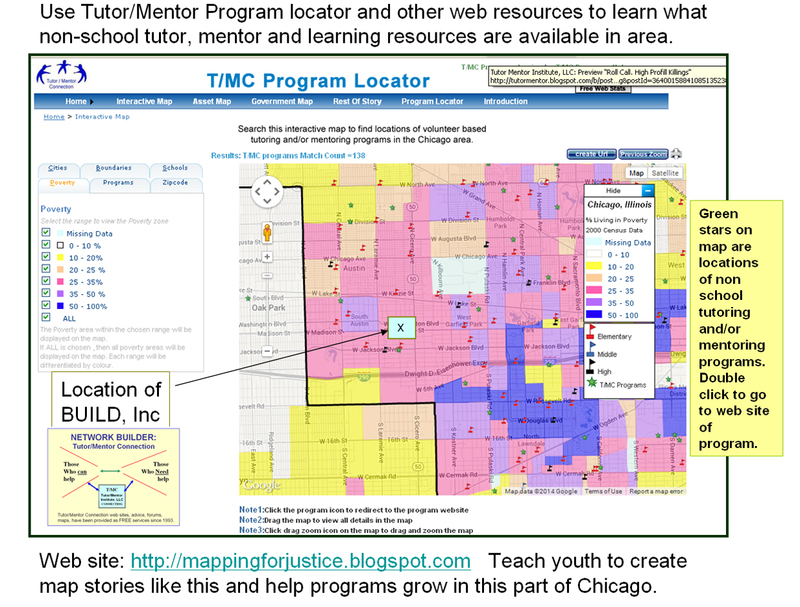 As others look at my web sites they could create their own visualizations showing ways local leaders can help needed youth serving organizations grow in their own neighborhoods. One role that needs to be taken is Community Information Collection. My map shows that there are tutor/mentor programs that I was not aware of. In every community area of the city and suburbs, teams could be collecting information to show who is already working to help youth. They could be plotting this information on maps, and sharing it in blog stories. They could be sharing it with myself and others who are building area-wide databases. Read more. If you're a business, you could have a team doing R&D to find reasons to support employee involvement, as a workforce development strategy. You could also learn ways you could expand your involvement. Read this Role of Leaders Pdf. Look at this article about Research & Development. If you browse through articles I've posted since 2005 you'll see frequent use of visualizations. I've posted some on Pinterest. Youth, volunteers, elected leaders and others concerned with violence, poverty and inequality can look at these graphics, then write their own story showing how they think the ideas apply to their own neighborhood, or to their own actions. As more and more people do this we begin to have the impact Bernie Sanders talks about in his Political Revolution. I mentioned that the Program Locator is not working properly. I'm looking for volunteers or partners who will help me fix current problems and updated to meet future opportunities.